STUDENT OF THE YEAR -- END OF THE YEAR TRAINING. Congratulations to BOBBY VINCENT, NIKI's newest black belt, on being named the 2007 Student of the Year at the New Iberia Karate Institute. Bobby is a dedicated black belt who has trained very hard to become proficient at Karate and who continues to set a good example for the rest of the dojo. Saturday, December 29, 2007 was the end of the year training. Here is a picture of the group with Bobby after the class. The spirit was very good and the training was consistent. This constitutes a perfect finish to the year and a perfect beginning for 2008. Train Hard everyone and lets all set our goals high for this year. OSU, Sensei Scott. All other classes will resume as normally scheduled. Watch our blog postings to see who was named NIKI student of the year. Thank you for a very productive and successful 2007. Lets plan on 2008 being equally as successful. BUDDY DAY AT NIKI. December 1st is “bring your buddy to karate” day. The group session will be from 10am to 11am with a question and answer period following. Students will wear their gis, but the buddies just wear loose clothing. This is an opportunity for you to bring your friends to karate and actually have them participate in a class at no charge. This could help them decide if karate is something they might be interested in and good at. So start thinking about which of your buddies you plan on inviting. KYU TEST. The kyu belt test for the students of NIKI will be held at our dojo on Saturday, December 15th. There will be a couple of pre-tests for all students on Wednesday, December 12th, 10:00 a.m. and also Friday, December 14th at 6.00 p.m. There is no cost for the pre-test. Registration for the test begins Tuesday, December 11th. Everyone must register by Friday, December 14th. Register early because there will be limited space for participation in the clinic. More Information is available in the newsletter at the dojo. an instructor training class on Sunday, December 9th at 10:00 am. CHRISTMAS PARTY. The NIKI/LKC Christmas party will be held at the LKC at a date and time to be determined in the next couple of weeks. We will let you know when it is decided. Everyone is asked to bring a dish of your favorite holiday treat for everyone to share. HOLIDAY SCHEDULE. Reminder, there will be no karate Wednesday 11/21 and Thursday 11/22. Classes resume Saturday 11/24 at 10:00 am. HAPPY THANKSGIVING EVERYONE. STUDENT OF THE MONTH. The student of the month for November is Bobby Vincent. Bobby is a 1st kuy. He is very energetic and radiates incredible spirit throughout the dojo. Bobby has decided to test for Shodan this month at LKA in New Orleans. For the past few months, he’s been training hard in preparation. He recently attended the Pre-Dan Clinic in New Orleans, which will only benefit his goal of becoming a Shodan. Congratulations, Bobby, on your karate accomplishments and good luck on your future karate achievements. As a recipient of the November award, he is now eligible for the Student of the Year Award given every December. Keep up the hard work and keep the school spirit high. Mobile KARATE camp. 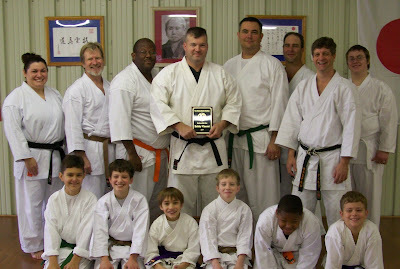 The annual Mobile Karate Training Camp has been offered by the University of South Alabama for the past 32 plus years. It is designed for any style of karate. It is scheduled for November 2nd-4th. Also, the ASKF Collegiate Tournament is scheduled for Saturday, November 3rd. The tournament features kata and kumite competitions and is open to all full-time college students. Look for the camp brochures at the office. A NEW BEGINNERS GROUP STARTS IN DECEMBER so if you know of anyone that would like to start training please let them know. ALSO there is a HALF PRICE REGISTRATION SPECIAL FOR NOVEMBER! STUDENT OF THE MONTH. The student of the month for September is Brayon Fremin. Brayon just recently tested for 4th kyu and did an outstanding job. He takes his karate seriously. He trained at the Lafayette Karate Club a few nights a week in preparation for his test. Brayon is an amazing student. He is very respectful and has a“can do” attitude. Brayon leads through example. He has determination and commitment in training. Congratulations, Brayon, on your karate accomplishments and good luck on your future karate achievements. As a recipient of the October award, he is now eligible for the Student of the Year Award given every December. Keep up the hard work and keep the school spirit high. MONTHLY TUITION. Your monthly tuition is now due for October. As a reminder, tuition for one student is $50.00 per month, and for two it is $85.00. Tuition is to be paid between the 1st and the 10th of themonth. MOBILE. 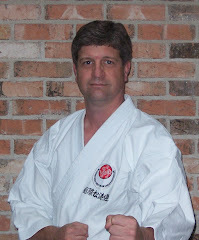 The annual Mobile Karate Training Camp has been offered by the University of South Alabama for the past 32 plus years. It is designed for any style of karate. It is scheduled for November 2nd-4th. Also, the ASKF Collegiate Tournament is scheduled for Saturday, November 3rd. The tournament features kata and kumite competitions and is open to all full-time college students.Look for the camp brochures at the office. THANKS to everyone for making the 2007 Acadiana Karate Camp such a special event again this year. Special thanks to Rose Shuff (LKC), Mike Junot(LKC), and to everyone who brought something or someone to the party. We seem to have just the right blend of food and people to keep everyone entertained. CONGRATULATIONS TO HALEY HEBERT --- SHODAN!!!! ALSO CONGRATULATIONS TO REED BELLINGHAM FOR SCORING A 6 MONTH RETEST FOR SHODAN! CONGRATULATIONS TO MOHAMMAD AND HOLLY FROM THE LKC FOR EARNING SHODAN AND NIDAN RESPECTFULLY! ­Mr. Decuir teaches Shotokan karate - a Japanese style that is characterized by strong focus (a concentrated moment of energy) made possible by full hip motions and a total body commitment to the technique. This is formal training, based upon traditional teaching methods, that gradually build up ones physical condition and mental concentration. Gichin Funakoshi is widely known as the father of modern Karate, which literally means empty hand. Karate is a system of unarmed self-defense using a variety of blocks, kicks, punches, and strikes. There are many karate styles, each placing different emphasis on certain aspects of training. The founder of Shotokan was Gichin Funakoshi, who taught karate to many individuals before his death in 1957. One of his students was M. Nakayama, a 10th dan and former chief instructor of the JKA in Japan. Mr. Nakayama died in 1987. It was under Master Nakayama that Mr. Mikami received his training and it is under Mr. Mikami that Mr. Decuir received and still receives his training. Thus, there is a direct and unbroken line of instructors who have nurtured and maintained the integrity of the traditional teachings. Shotokan karate is different from many other martial arts. Instead of thrusting the beginner immediately into actual sparring and contact situations - where injuries may easily happen and where little real learning can occur - Shotokan begins by teaching basic principles and movements. All other techniques are built upon this solid foundation. With an understanding of how power and speed are generated, progress will be made toward strong, effective technique. All black belt ranks are recognized internationally and are registered at JKA headquarters in Tokyo, Japan. Rank test include three main components: performance of a Kata, wherein you execute a prearranged series of defensive and offensive moves; Kihon, where you show your proficiency in basic techniques; and Kumite (sparring), in which you demonstrate your offensive and defensive skills in a controlled sparring environment. NIKI is certified and registered with the Louisiana Karate Assoc. (LKA), and the Japan Karate Assoc. (JKA). We enjoy affiliations with the largest and oldest karate organizations in existence in this state, country and world. So a student of our school not only retains his rank in perpetuity, but also is recognized by that rank throughout the entire world. While many independent martial arts’ schools may claim international roots, only a school certified by such organizations can be relied upon to teach authentic karate that is governed by uniform standards. As such, all the students of our school are tested quarterly by multiple certified examiners of the Japan Karate Association - World Federation (JKA-WF) to insure that the standards of our karate are consistently high. No other school in this area provides that. As members of the ASKF and the JKA, you gain access to many benefits of membership. Primarily, of course, you get continual guidance from highly-skilled and certified instructors, experienced evaluation for Dan and Kyu rank promotions, the right to participate in local and international JKA and ASKF karate tournaments, and dozens of other practical advantages. mind and your character. Why? Because the JKA is The Keeper of Karate’s Highest Tradition. Our karate is the strongest and most traditional karate there is. We see it not as a sport, but as a whole way of life. And that is always our emphasis: the whole. The goal is to help you develop every aspect of who you are. But the best reason to join is for karate itself. Authentic traditional karate has tremendous benefits for body, mind and spirit. Physically, karate is good for the heart, strengthens bones, builds muscle, creates resilience, develops hand-eye coordination, and makes the body less susceptible to sickness and injury. Mentally, karate helps develop patience, discipline, perseverance, understanding and open-mindedness, as well as concentration and focus. Spiritually, karate builds confidence, develops self-control and increases calmness and peace. A typical karate practice session usually begins with a comprehensive warm-up, followed by the various training exercises. The exercises are divided into three main categories: kihon (basic techniques), in which you learn the basic blocks, punches, kicks, stances, etc. of karate; kata (forms), in which you practice and physically remember the various kihon learned; and kumite (sparring), where your kihon and kata techniques are matched against a real opponent. As your skill level increases, so will the difficulty and degree of the exercises. Of course, there will also be times when you are taught theory, dojo etiquette and the more philosophical aspects of karate. Once you join the club, only four things will be expected of you. You are expected to be committed to your karate training, and to attend classes on a regular basis. You are expected to give your karate training your maximum effort, and to work hard during practice. You are expected to demonstrate the respect, humility and courtesy upon which karate’s long-standing tradition is founded. And of course, you are expected to pay your dues and other fees. There are affiliated dojo’s (karate schools) throughout the world. The JKA has branches in well over 100 countries, The ISKF has branches in all 50 states, and the ASKF has branches in all southern states from Texas to Tennessee, so there’s bound to be an affiliated dojo nearby. Please feel free to call (364-5000) and talk to the instructor, ask questions, etc. If you prefer to go in person, you can observe how a typical class is run. You can make any such arrangements directly with the instructor once you’ve received the dojo information from our representatives.